When we first started homeschooling I wasn't really sure what to expect. I had read a few books, talked to a few families that were homeschooling and thought it all sounded wonderful. At first I pictured idyllic days at home with my kids eagerly seeking out every learning opportunity there was. I pictured them happy and getting along like best friends. I pictured what all of the books portrayed; a happy family with kids soaking up knowledge like a sponge. After homeschooling for a few months my expectations had changed dramatically. Gone was the ideal and I was happy to make it through the day without one of us ending up in tears or yelling at one another. We kept seesawing back and forth from unschooling to traditional schooling at home and I had not expected us needing such a long period of adjustment. It took awhile to find our way and find enjoyment in being together and learning together. It seemed like each and every time things were going along perfectly... something would signal it was time for a small change or an adjustment. Not that we've been homeschooling for several years I find myself expecting changes; anticipating them even! After all, our homeschooling style, goals, and expectations should change as the boys grow and change. I couldn't have said it better. We still have those days but, for the most part after several years we expect those days. I cherish the good days that much more. Thank you! I do find that our difficult days seem to be a bit less than they used to and I'm not longer afraid to just drop the work, call it a day, and pick up fresh the next day. My sentiments exactly. We still make adjustments constantly. Thank you! It may not have been but I thought it was going to be in the beginning but I LOVE homeschooling my boys. The years just fly right by. 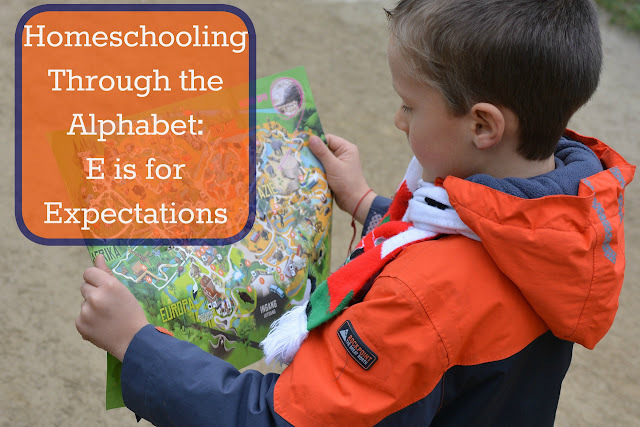 I am still hoping to reach some of my original expectations in our homeschool. It helps to know that I am not alone with some of the expectations that we have had and worked past! Thank you for sharing! I do think it is pretty common to struggle at first and even just here and there as we go along. I completely agree with you! Every time I think my expectations are within sight of being met, my kids' needs change once again and we need to readjust. I liked your post a lot. I sure hope so; if we never changed it sure would get boring and one thing I can say for sure is that homeschooling is NEVER boring! That is true it is a sign of change and growth which is good I just hate when books and materials we have really enjoyed using no longer meet those needs and we have to find something new to use-- since that can often take a bit of time with trial and error. But I am always happy to see them outgrowing materials!